That bizarre but amusing bug in Skyrim might not be there entirely by accident. 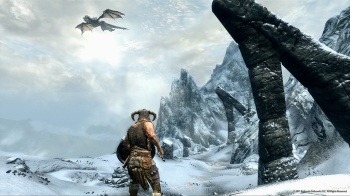 Don't expect Skyrim to be an entirely bug free experience; Bethesda's Todd Howard says that the studio doesn't fix every bug that it finds. If a bug is entertaining and fixing it would make the game less fun, Bethesda will sometimes leave it in. Undoubtedly, some people will raise a quizzical eyebrow at this practice: Bethesda games have something of a reputation for bizarre technical problems and this really doesn't help shake that. But Howard made it clear that Bethesda didn't take game-breaking bugs as lightly, and most of the entertaining ones didn't make it either. "We try to solve most of it; we're sensitive to a lot of it," he said. "If [a bug is] gonna break the game, or unbalance the game in some way, we do try to solve it." Anyone who expects a videogame to be completely free from bugs is probably being a little unreasonable. Mistakes happen, and there's no way that testers are going to be able to predict or replicate everything that a player might do. But actively leaving bugs in a game doesn't seem like such a great idea, especially in immersive RPGs like Oblivion or Skyrim. Personally, I'm hoping not to run into too many of them, entertaining or otherwise.